Yes, the Japanese kanji can be mastered. You can pass the highest level of the Japanese Language Proficiency Test, and you can read Japanese novels and newspapers. In this guide, we will show you step by step how to go from absolute beginner to kanji expert. It will not always be easy, and sometimes you may want to give up, but we will show you how to have fun along the way. With perseverance you will make it! First, it helps if you know a bit about your personal style of learning. Do you read a lot? Do you find you need to write down notes or draw pictures? Can you absorb information when you hear it but don't see it, for example in lectures? You may work best with one of these three approaches (usually referred to as visual, kinesthetic, and auditory), or you may need a mix. Your learning of the kanji will be most effective if you recognize your style and choose learning activities that match it. If you are a visual learner, reading and flashcards will work well for you. If you are kinesthetic, writing out kanji on paper will help, as will using multiple exercise types. If you are an auditory learner, reading aloud will benefit you, as might learning in a group session. Your most important choice in learning the kanji is your framework, or approach. Most people who learn the kanji do not actively decide on a framework, and they default to what we call 'brute force' - they choose kanji based on when they are encountered, and they learn them just by 'trying hard': they try to remember the shape, they look it up every time they see it, and they try writing it out or putting it in flashcards. While this framework works (eventually), it is not easy or efficient, and it can be very frustrating. A much more effective framework for learning the kanji uses a combination of two core concepts: 'kanji components' (based on how kanji are put together) and 'mnemonics' (based on how memory works). We believe this is the framework that will lead you to kanji mastery the fastest. Here's how it works. 漢 is made of up two main components - 氵 and 𦰩. The right hand part, 𦰩, is itself a combination of 艹, 口 and 夫. Similarly, 字 is made up of 宀 and 子. The important thing about this is that there are only around 300 components that make up all kanji in use. So while you need to know 2000 characters to pass the highest level of the JLPT (Japanese Language Proficiency Test), and potentially thousands of others for reading Japanese names or novels, in fact they are all combinations of the same small set of building blocks. 300 probably still sounds like a lot, but 300 is a lot more manageable than 2000! By the time you start on the kanji, you have already learned about 100 hiragana and katakana. Plus, since every kanji is made up of these components - and this is the really important bit - every time you look at a more complex kanji, you are reminding yourself of the meaning of the components too! The best framework for learning the kanji combines these concepts. For each kanji, we create a simple phrase that is easy to remember, that combines references to the components, and that leads to the meaning of the kanji. 氵is an abbreviated version of 水 and means 'water'. 𦰩 is a standard combination of the three elements 艹 (grass), 口 (mouth) and 夫 (husband), and appears in a handful of common kanji. However, it is not a kanji in its own right, so rather than try to memorize a meaning, we just combine the meanings of its elements in a standard way - 'the husband (夫) with the grass (艹) mouth (口)'. This simple phrase is not hard to remember - in fact, it becomes very easy once you start to remember the meanings of the components, which is very easy because they are so common. For example, 氵 appears in 180 common kanji - you are going to see it a lot! One of the keys to this system is that the mnemonics should be based on the actual meanings of the components. Mnemonics which use 'made up' meanings based on what a component (or kanji) 'looks like' are not as effective - they just give you more to remember. So now you have decided on your approach (some combination of visual, kinesthetic and auditory exercises), and you are convinced that mnemonics + components is the way to go. How are you going to go about this? You need structure. You need a systematic way to go from the simplest starting point forward. The hiragana and katakana often seem like a daunting first step - two whole alphabets to learn! There is no shortcut - you need to memorize 48 symbols for each one. However, the rewards are enormous. In every Japanese sentence, 50-75% of the characters are hiragana or katakana. They are fundamental tools for reading any modern Japanese, and you will use them constantly. Plus, memorizing them feels like a tremendous accomplishment - one you will be reminded of every time you pick up your studies. With two basic tools, flashcards (for recognition), and paper (for writing them out, which creates muscle memory), you can master both within a few weeks. Key takeaway: learn the hiragana and katakana early! Kanshudo provides free flashcards you can use anywhere any time - go to your Flashcards home, and click Create hiragana flashcards. The next step is to learn the most useful kanji. The reason is a practical one: you will encounter these kanji everywhere, especially if you are in Japan. Once you know 100 kanji, you will be able to read many signs, and will understand at least part of many other written messages you will encounter. Plus, some of the most common kanji are themselves very common components of other kanji. Finally, when you come to learn vocab, many words use a more common kanji in conjunction with a less common one. The best way to learn the 100 most useful kanji is with our Beginner Lessons, which will take you through them step by step along with about 200 words and 50 of the most useful grammatical constructions. 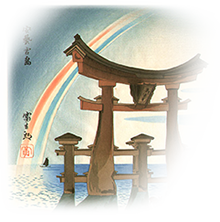 Alternatively, or in addition, take the Kanshudo Challenge for each of the kanji. View your Challenge status here. 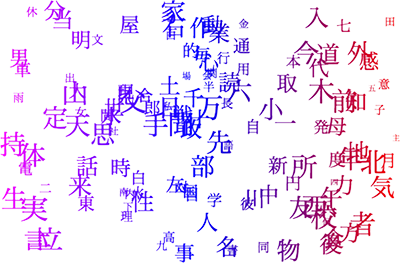 You can also view the 100 most common kanji collection in the kanji, word and name Collections on Kanshudo. Which kanji are most useful for you may depend a little on your specific situation. If you are studying Japanese at school or from a course, you will want to learn the kanji in your course. If you are visiting or living in Japan, learning the kanji encountered most commonly in daily life would be good. If you are teaching on the JET program, kanji commonly encountered in schools and classrooms would be a big help. If you are learning Japanese for the purposes of studying or working in Japan, you will very likely need to pass the JLPT (Japanese Language Proficiency Test). If so, the kanji in the first level of the JLPT (called N5) would be very useful. Key takeaway: work through the most useful 100 kanji to give yourself a great foundation. Use the Beginner Lessons to get a comprehensive introduction, or use the Kanshudo Challenge. At this stage, mnemonics will sometimes feel like an uphill battle, because the components will be as new to you as the kanji themselves. For example, take 思 (which means 'to think', and is the #23 most common kanji). Here, it will help you to look at the components, because both are common kanji themselves (in the top 100). The top part is 田 ('rice field', the #50 most common kanji) and the bottom part is 心 ('heart', the #63 most common). So our mnemonic, 'the heart under the rice field thinks', will help cement all three kanji in your mind. However, in some cases focusing on the components means a little more work. A good example is 気, which is a very common kanji meaning 'spirit'. 気 is made up of four components (𠂉 一 ⺄ and 㐅), and while one of these (一) is one of the most common kanji (it means the number one), the others are not, so learning them when you are just starting on would give you more to remember. So for the first 100 kanji, it's best to apply the same techniques you used for the hiragana and katakana, and memorize the kanji directly. You will start to absorb the meaning of the components used along the way automatically. Now you have mastered the hiragana, katakana and 100 or so common kanji, you will be starting to be able to read quite a lot - you will recognize fragments of sentences in newspapers or books. You will probably have started to pick up kanji outside the top 100, such as those you encounter in daily signs (e.g. the universal 引く and 押す on doors). However, you will not be able to read many full sentences due to lack of grammar, and you will not be able to read many consecutive sentences due to your limited kanji and vocabulary. Plus, you will find it hard to have an actual conversation with anyone, which is certainly the best way to learn to *speak* Japanese. You need to tackle these problems systematically by learning grammar in parallel with your expanding kanji knowledge. You can buy a textbook and study on your own. We recommend the Japanese for Busy People series. If you use this series, you can use our Japanese for Busy People kanji collections to speed your studies. You can enroll in a language school or course in Japan or near where you live - most major cities in the world have several. You can find a private tutor - try looking for advertisements in a nearby Japanese supermarket or in your nearest 'Japan town', or look online. Look for a local society or club connected with Japan - most have some sort of language program. For example, in the US you can join the Japan Society. Now that your general Japanese ability is progressing, it's time to expand your kanji knowledge systematically. To do this, you need to prioritize your efforts and take a systematic approach. Here's how. 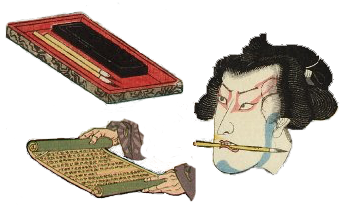 Since kanji are the basis of the written language, the best way to determine the order in which to learn them is to look at how commonly they are used in written text - especially the kind of written text you are going to be reading. For some people that might be newspapers, for some it might be novels. For many students, it will be the texts for the courses you take and the exams you need to pass. So the key to success is to learn kanji by 'frequency order' - in other words, to start with the kanji you encounter most commonly first. At this point, you will start to benefit greatly from the components + mnemonics approach. Every time you learn a kanji, take the time to see what components it is made of, and to learn those components. Initially this will slow you down a little, but as time goes by, it will speed you up, because when you see a new kanji, you will know all the components, and the mnemonic which combines them will just 'slot into place' in your memory. 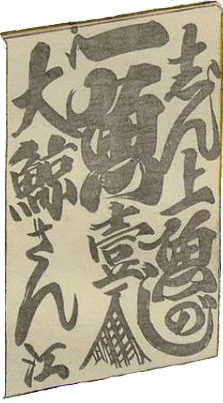 The Kanshudo series of lessons, the '53 Stages of the Kanshudo', presents the most common 1000 kanji (including all kanji required for levels N5-N2 of the JLPT), in lessons of about 20 each. Kanji are ordered partly to correspond with the levels of the JLPT, and within those, they are prioritized based on how commonly they occur in modern written Japanese (across all media - websites, novels, and newspapers). 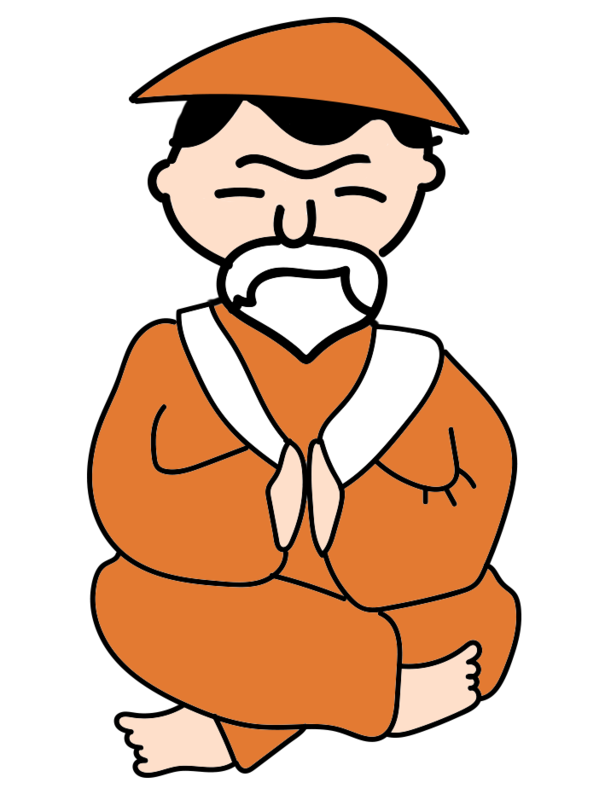 All lessons can be taken on a computer or mobile device at any time, as part of a subscription to Kanshudo. If you complete the Kanshudo lesson series, you will know all kanji needed for the second highest level of the JLPT! The more you encounter a kanji, the more likely you are to remember it. In the early days, when you can't read newspapers or magazines easily, one great way to increase your exposure is with flashcards. 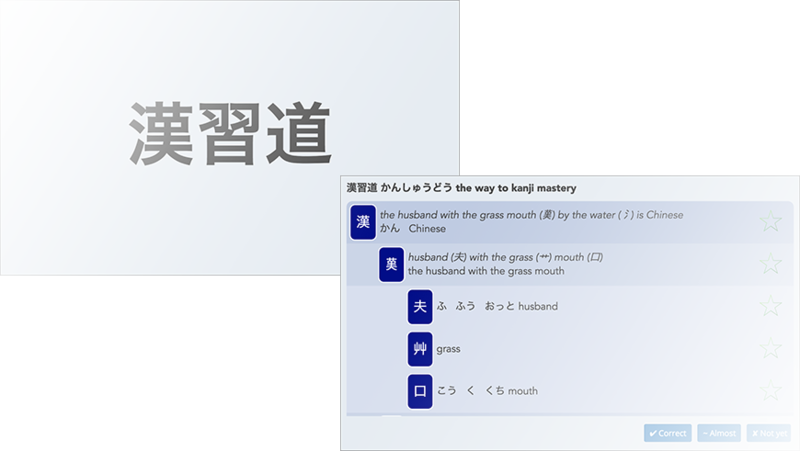 On Kanshudo, as you work through the first 100 kanji using the Beginner Lessons and then the first 1000 kanji using the Intermediate Lessons, each lesson automatically generates flashcards for you. Moving beyond the lessons, you can generate flashcards based on individual kanji you tag as a favorite, or based on frequency, as well as based on the words you encounter. Kanshudo flashcards automatically display the kanji used in words to make it super easy to remember the kanji in context. Kanshudo flashcards also work well with your mobile device so you can study whenever you have a spare minute on the go. For more about flashcards, see our guides, How to use spaced repetition flashcards to study Japanese and How to create flashcards. You should also sign up for the Daily Kanji email, a free daily email with a single kanji, chosen randomly or based on a starting frequency that you can set. Once you are able to, finding good material to read is the best way to increase your exposure to kanji while expanding your vocabulary. Short stories are an excellent way to begin, and books of short stories which include furigana for the kanji, or even English translations on the facing page, are a great help. Key takeaway: try to surround yourself with kanji in as many ways as you can. And sign up for the free Daily Kanji email! It is much harder to stick with a task you find dry and boring than with a task that is enjoyable. 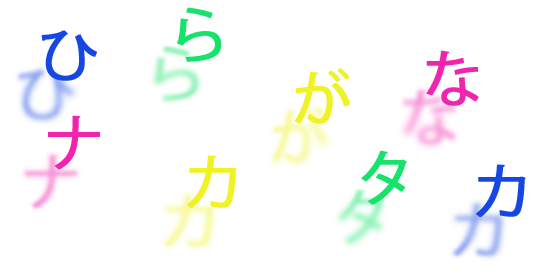 Make your kanji study fun! There are several effective ways to do this. Use Kanshudo Challenge. Kanshudo Challenge is the most sophisticated system available for studying a kanji. A Challenge consists of a series of games and exercises built around a kanji, its most useful words, and examples that use the words in context. The exercises are designed to use different learning styles to help reinforce your memory in different ways. Kanshudo Challenge is both fun and extremely effective. Read more in our Challenge how to guide. Play learning games. Kanji and word games are engaging and fun, and can help your recognition and retention significantly. On Kanshudo, start with Kanji Builder, Kanji Match, Word Match or Sentence Complete. More games are available within lessons (see below). Introduce variety. Simply reviewing flashcards for hours every day is a hard regimen to sustain. Introduce some variety into your approach. Put ticks in boxes. If you are a goal-driven person, the satisfaction of putting ticks in boxes is a strong motivator. By dividing your kanji progress into discrete challenges, you can put a tick in a box every time you complete a challenge, and you can see your steady progress. Systematically completing Challenges is a great way to do this, as is working through the Beginner or Intermediate Lessons. Use your knowledge to do things you enjoy. Most likely, you are not learning Japanese kanji just because you have to - you are doing it for a personal reason. Whatever that reason is - whether it's to help your job, to help you with daily life, to enable a hobby such as reading Japanese novels - get started with it! If you use your kanji for something you find fun, you will increase your exposure and have fun at the same time. In real life, you will mostly encounter kanji as part of compound words (jukugo) and sentences. So to read real Japanese, you will need to expand your vocabulary beyond the readings of the kanji alone. The best way to learn vocabulary is to learn it alongside the kanji it contains - if you have forgotten a kanji, you are more likely to forget a word that contains it. Kanshudo makes this very easy by enabling you to create vocab flashcards from lists you create yourself, or by importing directly from several popular dictionaries. The word you want to learn is displayed on the front, on the back, all the kanji used in it are displayed under the reading/meaning of the word. This enables you to learn or remind yourself of the kanji as you learn the word, cementing both in your mind at the same time. This is by far the most efficient way to learn vocabulary. For more information on vocab flashcards, read our step-by-step guide: How to create flashcards. Although it may seem like a remote future if you are just beginning, eventually you will want to go beyond the Jōyō kanji and become a true kanji master. If you read Japanese novels, for example, you will encounter a much broader range of kanji than the set included in the Jōyō - kanji used in names, traditional variants of modern kanji, common words written with non-standard kanji and so on. If you build a secure foundation for your kanji knowledge (knowing the components, working with mnemonics, creating and using flashcards), there is no limit to how many kanji you can learn. The highest scores on the Kanshudo Quiz, which provides an assessment of kanji knowledge, show that some students are already past 3000 kanji. The highest level of the Kanji Kentei (日本漢字能力検定), the primary kanji aptitude test used within Japan for native and non-native Japanese speakers alike, tests knowledge of 6355 kanji! Undoubtedly, with every kanji you know, learning one more gets easier and easier. With the tools and framework introduced here, you can do it too. Become a kanji master! Ready to get started? Kanshudo can help you through every step in this program. Dive into our Feature overview, read more in Getting started learning Japanese with Kanshudo, or go to your Kanji Wheel for personalized study recommendations.